Republican Brian Kemp is calling on Democratic opponent Stacey Abrams to concede in their race for Georgia governor, but she's showed no signs of backing down and has filed a federal lawsuit calling for rejected provisional and absentee ballots to be tallied. Abrams is seeking a runoff against Kemp, who led by about 59,000 votes as of Sunday evening and has already declared victory in the race with 50.3 percent of the unofficial vote count in his favor. In Georgia, statewide races go to a runoff if neither candidate clears 50 percent of the vote. 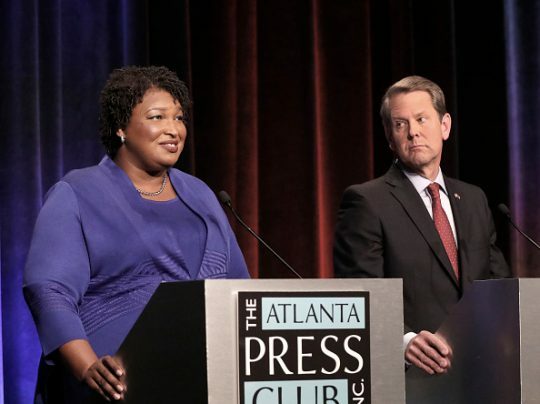 In a conference call with media members on Sunday, Abrams' campaign said she needed to net 21,727 additional votes to force a runoff, the Atlanta Journal-Constitution reported. Kemp's campaign has called it mathematically impossible for Abrams to get the requisite number, and it also said in a statement that her refusal to concede was a "disgrace to democracy." There is a dispute between the camps on the number of provisional ballots; the Georgia secretary of state office said there were 21,190, while Abrams' campaign aides estimate there are more than 26,000 votes that have yet to be counted. The lawsuit has challenged the rejection of more than 1,000 absentee ballots it says were turned down for minor mistakes. Georgia's 159 counties have until Tuesday to certify the vote results, and the lawsuit would delay that deadline until Wednesday. The lawsuit seeks to count rejected provisional ballots because of registration errors in DeKalb and Gwinnett counties, two metro-Atlanta areas that would favor Abrams, CNN reported. Abrams spoke to supporters in a Facebook video on Sunday night about why she was continuing to fight, saying she wanted to win but it was also about voters having confidence in the system. "People should have confidence that their votes matter … The point is that the system has to work. The point is we have to have confidence in that system, that our democracy is bounded together by our common belief that what we do matters, that our vote matters, and that every vote counts," she said. Kemp spokesman Ryan Mahoney said the latest maneuvers by Abrams showed she had "moved from desperation to delusion." "Yesterday, military, overseas and provisional ballots were reported throughout Georgia. The counts are in line with publicly available tracking reports. This is not breaking news and does not change the math. Stacey Abrams lost and her concession is long overdue," he said. Abrams is trying to become the first black female governor in American history. Their bitter race was marked by accusations from Abrams and her supporters that Kemp used voter suppression techniques. He was Georgia secretary of state until resigning last week in anticipation of moving into the governor's mansion. The Weekly Standard reported such charges were not borne out by the facts. President Donald Trump endorsed Kemp and tweeted on Friday that he had won the race and it was "time to move on!" Democrats have not won a governor's race in Georgia since Roy Barnes triumphed in 1998. The winner replaces term-limited Republican Gov. Nathan Deal. This entry was posted in Politics and tagged 2018 Election, Brian Kemp, Georgia, Stacey Abrams. Bookmark the permalink.